If you’re like most coaches, when you first got into coaching you were amazed at how effective (and how counter-intuitive!) the whole discovery methodology really is. Many of us come from a strong background in delivery – I have the truth and I deliver it to those who need it. So the switch to discovery was both refreshing and challenging. As great as the discovery methodology is, it can be overdone. You can have too much of a good thing, even too much reliance on discovery. In fact, I’ve noticed five specific ways that coaches often overdo the discovery approach. You might think of these as “heresies” in that each goes against the grain of the coach’s commitment to draw out the client’s expertise. Please, don’t burn me at the stake just yet! Read all five and see how embracing these truths might improve your own coaching effectiveness. Resist Discovery During Contracting. Okay, I’ll start with an easy one. This is a heresy that’s not too far out there for most coaches. But some beginner coaches feel like they must always pull everything from the client, including the details of the coaching contract. Please don’t do that. Contracting is a time when the coach is the expert and must leverage his or her expertise for the benefit of the client. It’s your job to tell the client how much you charge, how often you’ll talk, and other details of how the coaching relationship works. While it’s fine to be flexible, don’t expect to draw out a contract from your client – if you do, the only thing you’re likely to discover is that you have no clients. Tell Your Client How to Be Coached. Similar to the need to be an expert about contracting, coaches know how coaching works including how clients need to engage the coaching relationship. I’ve seen way too many coaches struggle with “difficult” clients because the coach was unwilling to teach the client how to be coached. Imagine a dentist who grew frustrated because of the patients who never opened their mouth yet was unwilling to say, “Open wide.” Instruct your clients on issues such as how long their responses should be to your questions, to stop talking when they stop getting somewhere new in their thinking, and how to prepare for a coaching session. Assign Homework. Talk about the epitome of telling people what to do! Homework?!? Yes, it’s not only okay for coaches to assign homework, it’s actually a good thing (when done appropriately). What is appropriate? Homework is about further learning and awareness, not actions that address the client’s issue. For example, a client who’s learning to stand up to her boss might benefit from noticing her own internal dialogue when she’s around her boss or others in authority, so the homework could be to notice and capture those thoughts at least three times over the next week. If the coach directed the client to say or do something that constituted “standing up to her boss,” then that would not be homework, that would be advice (and that would not be coaching). Hold Your Client Accountable. Who’s responsible for the client’s outcomes? The client. Who’s responsible for the client’s actions? The client, of course. So how can the coach hold the client accountable? Is that not the heresy of coaching heresies? Let’s be clear that the client is always accountable to the client, but the client can establish structures of accountability that support client follow through. The coaching relationship is, by its very nature, one such structure. I hear of coaches who refuse (sometimes adamantly!) to ask the client how it went with the action the client said they were going to take during the last session. IMO, that’s foolish and silly. Of course you should ask. You shouldn’t ask in a shame-inducing, judgmental, “you’re in trouble if you didn’t do it” sort of way, but you should invite the client to share how things went and to address any roadblocks or successes appropriately. If you’re concerned about always doing coaching “the right way,” you may need to get off your high horse and meet your clients where they are: in the real world. In the real world, the way forward is not 100% drawn out and discovered by the client looking inward. The real world of coaching is a beautiful partnership where the coach supports the client mostly by creating awareness (discovery) and sometimes by providing direction and/or structure. What about you? Which of these coaching heresies do you embrace? Which ones do you resist? 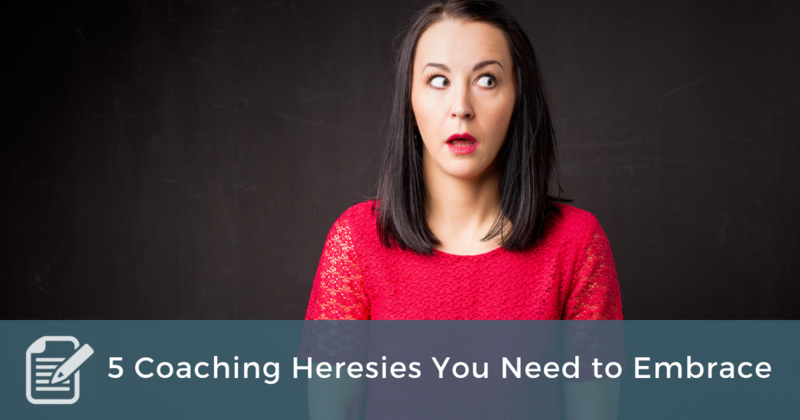 What additional coaching heresies should we consider? Thank you for speaking around this subject. What a great read. I would say “Frameworks” is one coaching heresy I definitely need to embrace and develop some more. I have to get better at explaining this part to my clients.